Edinburgh just wouldn’t be the same without its colourful history. Steeped in myth, folklore and legend, our fair city would be nothing without the interesting characters that built it. Here’s Factotum’s list of Edinburgh’s most interesting former residents. 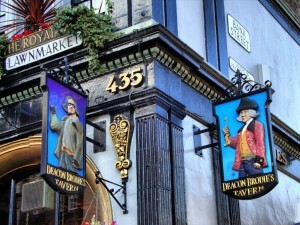 The Deacon Brodie name is now known as one of the Old Town’s most iconic pubs. The original Deacon William Brodie was born to a respectable Edinburgh family in 1741. He grew up to become Deacon of the Guild of Wrights and a Freeman of the City. A respectable man by all accounts. But this was all just a front, as Brodie led a secret double life that included a gambling addiction, two mistresses (with five children between them) and an organised crime network that funded his gambling debts. He was eventually arrested and hanged on the Tolbooth gallows. His life is said to have been the inspiration for Robert Louis Stevenson’s ‘Dr Jekyll and Mr Hyde’. Peter Williamson was one of Edinburgh’s least known but most fascinating characters. He was kidnapped from Scotland as a young boy and sold into slavery in Philadelphia in 1738. Peter was a favourite of his owner, and by the age of 24 had gained his freedom, married the daughter of a wealthy plantation owner and amassed 200 acres of his own land. However, his home and lands were plundered by Cherokee Indians and he made a narrow escape back on a ship to England. Arriving penniless in York, Peter wrote a book about his experiences, dressing like a Red Indian, performing war dances and painting his face for dramatic effect. The book sold well and funded his journey back to Edinburgh, where he opened a successful coffee house in the old Parliament Hall. A keen entrepreneur, Indian Peter also opened a tavern in the Old Town, compiled and published Edinburgh’s first street directory, invented waterproof inks and stamps for marking linen, launched and ran a periodical magazine, and set up the city’s first postal service. Known as the Penny Post, it was the first service of its kind in Britain and eventually became the General Post Office. 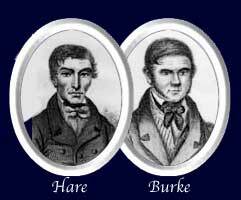 The notorious William Burke and William Hare were famous Edinburgh serial killers. Due to a decrease in executions in the early nineteenth century, the world-leading Edinburgh Medical School found itself short of bodies for dissection and teaching. Seeing an opportunity, Burke and Hare were not satisfied with simply grave-robbing already deceased bodies (a common occurrence at the time), so they started murdering victims to sell for dissection. They were responsible for seventeen murders before William Burke’s execution in 1829. Fittingly, his body was dissected in the University’s Old College the next day. Born in the Grassmarket in 1745, James Graham was known as one of Edinburgh’s most notorious medical ‘quacks’. He established the ‘Temple of Health’, where he promoted his various miracle powders, medicines and elixirs. From the Earth Bath (burying clients up to their chin in warm earth for ‘beneficial health reasons’), to the Celestial Bed (filled with stallion hair to cure sterility), his cures became increasingly radical and fell out of fashion by the mid 1780s. He built himself a house at the top of Arthur’s Seat ‘to experience the utmost degree of cold that the climate in Edinburgh had to offer’, and became known as an eccentric until his death in 1794. Of course, there are many more interesting characters. And many more to come, we’re sure.